VIRAC, Catanduanes—Just before his fight with American boxer Christopher Algieri, Manny "Pacman" Pacquiao expressed his gratitude to the people of Catanduanes for their support. 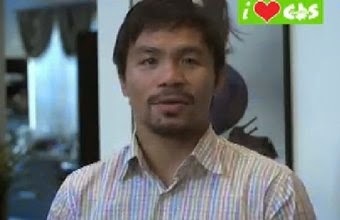 In a 20-second video uploaded by Catanduanes Serbihan, the People's Champ said he dedicates the fight to the Catandunganons. He also thanked his friend, Catanduanes Rep. Cesar V. Sarmiento. Sarmiento, on his part, urged Catandunganons to cheer on the Filipino boxing legend as he exchanges blows with Algieri.